After being told countless times that she “wouldn’t go far in life,” Apefa Adjivon did just the opposite. When she immigrated to Canada from Sierra Leone with her family at a very young age, she was living in an area where she was frequently told she needed to marry a man who can take care of her in order to have success. Instead of letting those attitudes discourage her, Apefa founded the Pearl Project to try and change the community conversations around what it means for a young woman to be a success. Apefa’s wholly committed to inspiring, motivating and empowering young women to be the best they can be. Talk about #girlboss! Who or what is your biggest motivation in life? My biggest motivation in life (and role model) is my Mom. She is the strongest, most beautiful, intelligent and resilient person I have ever met. Knowing everything she has been through to be where she is today, motivates me to keep working towards my dreams. Why did you decide to found the Pearl Project? My family immigrated to Canada [from Sierra Leone] when I was very young and when we first moved, we lived in a very low-income area. Growing up there, I faced a lot of negative influences. A lot of the youth in the area, including me, were told not to have high ambitions or motivation, or even try, because they believed that it was a waste of time and we wouldn’t go far. The messages were especially horrible for girls, because we were told if we wanted to be successful we needed to “marry someone who could take care of us,” rather than to work hard and stay motivated and build something for ourselves. My parents are extremely hard workers and we eventually moved to a middle class community, where I was in a much more positive, encouraging environment. In this environment, I thrived and was able to find success. However, a lot of the students I knew didn't grow up to go on to a university. A number of them got caught up in drugs and other negative influences—and I couldn’t help but wonder why this happened. The more I thought about it, the more I felt like someone should be doing something about it and the more I felt compelled to be the person to do it. I decided to create the Pearl Project because I recognized that the same issues and negative messages I was facing back then are the issues girls are facing now and that there are communities just like the one I lived in not just across Canada, but around the world. The Pearl Project is my effort to inspire, motivate and empower girls so that they can create change in their own communities. The Pearl Project has its name because pearls are extremely rare and are created under intense pressure. But, they’re also beautiful and strong — just like the girls we work with! My mother’s name is also Pearl and she is the strongest woman I know and my biggest role model, so I had to name it after her. What was the most difficult challenge you faced when creating the Pearl Project? The most difficult challenge I faced creating the Pearl Project was gaining support! Being a young person, being female and being black, a lot of people underestimated me. It can be extremely hard to gain funding and partners and really be taken seriously when people are judging you and assuming you have nothing to bring to the table because of your age, gender and race. Despite how far the Pearl Project has come and the accomplishments it's made, there are still people who believe that this is just a side project for me and that it will go away. But the Pearl Project and I are here to stay. My top goals post graduation are to attend law school (Harvard is my dream institution), to travel and to make running the Pearl Project my full-time job. 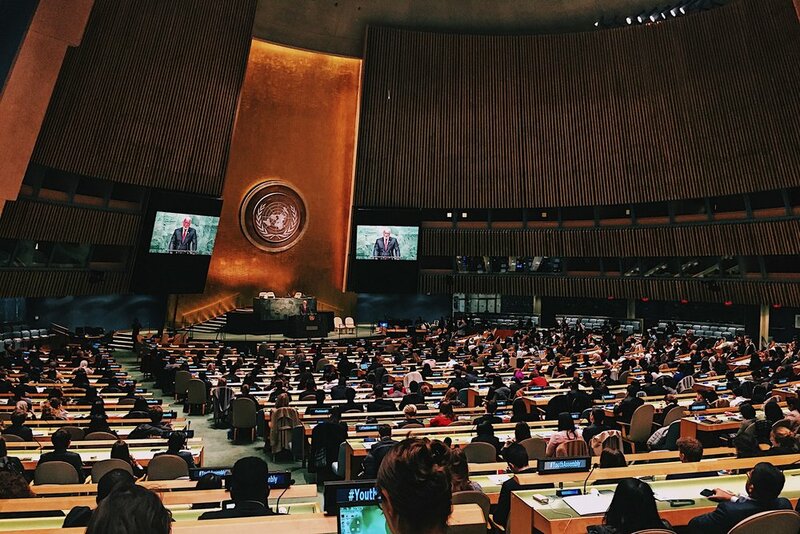 How has serving as a youth delegate for the Youth Assembly impacted your life? I would say that being a youth delegate has changed my life! Prior to the Youth Assembly, the biggest thing I had been involved with was leading my local youth group. I wasn’t really someone who put myself out there, I hate feeling like I’m being judged and my biggest fear is failure, so that held me back from doing a lot. But at the Youth Assembly, I met so many amazing and inspiring young people from all over the world who really stood up for what they believed in and were working hard to make the world a better place. The Youth Assembly was also the first time I ever pitched the Pearl Project professionally and I did it at the United Nations Headquarters! I’m the girl who wouldn’t even apply to speak at my own graduation because I didn't want to have to stand in front of everyone. It took a lot of bravery, but once I did stand up and speak about the issues close to my heart and how I thought they could be fixed, people agreed with me. The Pearl Project received its first grant and I had stepped out of my comfort zone and liked it. When I returned from the assembly I had a network of kind, inspiring and motivating youth to connect with and who believed in the same things I did. I learned that speaking up does make a difference and became extremely involved on my campus. Most importantly, I found a team of other young women to help turn the Pearl Project into a reality. At the Youth Assembly, I found my voice and through my voice I found my power. The biggest advice I would have is that if it’s something that you can’t stop thinking about and it's something that scares you, you should do it. It doesn’t matter where you’re from, what you have, or who you are, if it’s something you’re passionate about you should just start and everything else will work itself out along the way. Within the next five years, I hope to graduate university, become fluent in Spanish and proficient in French, study abroad, get published, give a TED talk and start a company with my mom! Motivated, Ambitious, Confident, Charismatic and Hardworking.